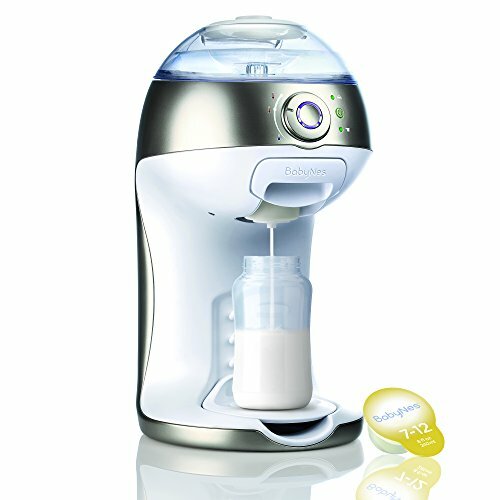 Create the perfect bottle in less than a minute with BabyNes formula and dispenser system. The BabyNes formula dispenser delivers superior hygiene, intuitive design, lump-free formula and a happier bottle-feeding experience for babies and parents. To prepare your bottle, adjust the temperature and simply pop the formula capsule in. Only compatible with BabyNes formula capsules. Works exclusively with BabyNes formula capsules: 4 age-specific formulas for 0-12 months designed to meet babies nutritional needs at each stage of development. Prepares your baby's bottle in less than a min, perfectly mixed, precisely measured, at the desired temperature. No pre-heating time, works with any bottle size, includes removable water tank (27 oz. ), no BPA. Includes a voucher for your first box of formulas and the "on-the-go" capsule opener. We ensure that all ingredients used in BabyNes are coming from Non-GM crops. If you have any questions about this product by Gerber BabyNes, contact us by completing and submitting the form below. If you are looking for a specif part number, please include it with your message.